An underperforming Medicaid eligibility program resulted in a loss of millions of dollars of revenue at three hospitals in a large health system. Parallon (formerly The Outsource Group), deployed an 11-person on-site staff to more effectively identify and case-manage Medicaid eligible patients, ultimately securing payment with these accounts. The result: an increase of $20 million in Medicaid payments in one year. An inability to adequately identify patients who were eligible for Medicaid or other programs was adding to days in accounts receivable and negatively impacting revenue. The improved process included an end-to-end account lifecycle that incorporated a comprehensive operating platform consisting of initial screening and analysis, case management and development and quality assurance program and technology. To execute this platform, Parallon recruited a local team of 11 PBAs with Medicaid experience to work onsite at each of the hospitals. The PBAs underwent two weeks of training to learn proven practices in identifying possible eligibility, case managing applicants and customer service. The PBAs were also trained to educate patients to use clinics rather than emergency departments for non-urgent care to reduce their cost. As the new process went into effect, monitoring and feedback sessions were held for three months to gauge progress. Parallon team members continued working one-on-one with on-site staff for an additional eight weeks. The team also coordinated improved operational processes with personnel from each hospital in seven departments, including the business office, patient access, case management/utilization review, nursing, medical records, human resources and information systems. 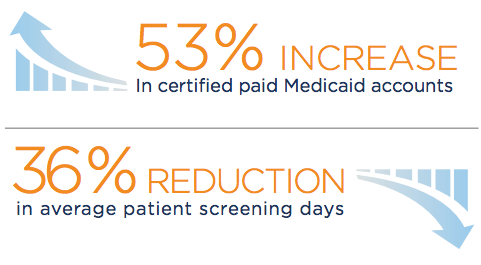 Parallon’s process produced significant results in improving Medicaid eligibility for the hospitals. Certified paid Medicaid accounts increased by 53 percent, more than $20 million, year over year, while average patient screening days saw a reduction of 36 percent.